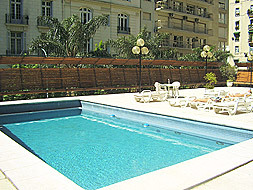 Two bedrooms apartment located in Callao Avenue and Juncal st. in Recoleta neigborhood, very close to Village Recoleta, beautiful restaurants, bar, shoppings, cinemas, museums, art galleries. Living/Dining room with huge windows with panoramic view over the city. Comfortable and modern white sofas, table and chairs for 6 people. The master bedroom has Queen Size bed, ample closets and panoramic view over the city. The second bedroom has twin beds, ample closets and panoramic view over the city. Bathroom with bath tube and shower. Fully supplied Kitchen. Cable TV. Stereo. Internet high speed connection. Air Conditioning. Heating. Washing machine. Phone with local calls included. The apartment is in a 20th floor of a Tower full of amenities: 24 hours security, daily maid service, gym, pool and solarium, sauna, tennis court, bar/restaurant with service room.Two bedrooms, complete bathroom. Hardwood floor. Aircon in living and the bedroom. Cable TV, High Speed Internet. Fully equipped kitchen with dishes, toaster, microwave, Kitchen utensils and dishes. Bed linens and towels. cinemas, church, university, gym, solarium, restaurants, pub/bars, nightlife area, exclusive commercial area, square, cinema, museum, art gallery, cultural centre, historical place, market, convention centre, laundry and parking space. Included: Electricity, gas, water, telephone ( local calls), Internet, city and building taxes.